With a heavy heart, I endured another bout with weariness. 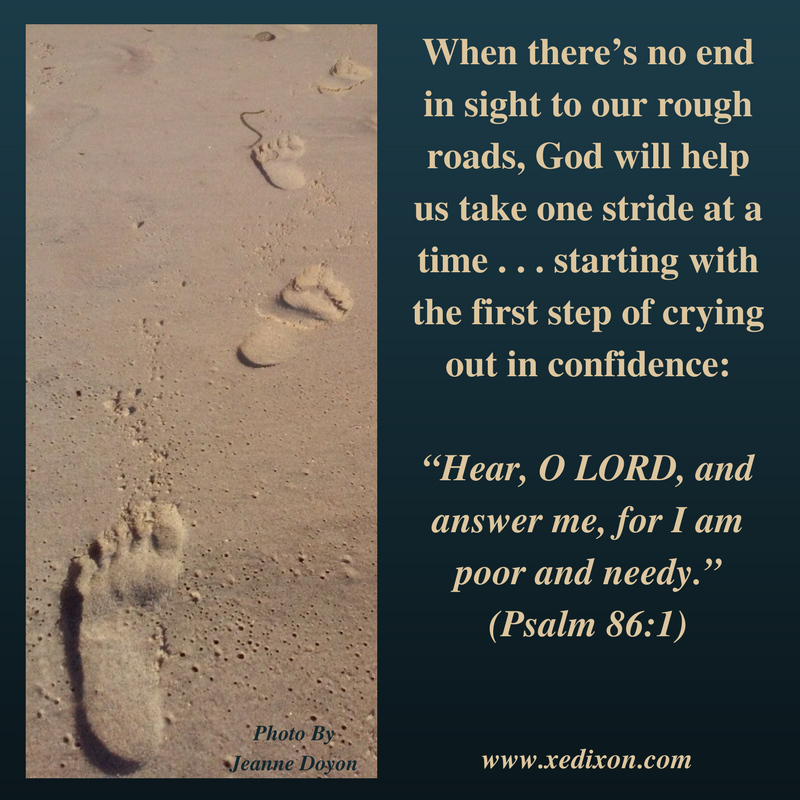 Though discouragement crept up on me, God continued to help me trust Him with my troubles. Over the last few months, He’s blessed through interactions with some amazing people who minister to others even though they are enduring great suffering. Their passion for serving God and others as they praise Him in all circumstances deepens my faith and my desire to serve the Lord with every breath He gives me. God has given me numerous opportunities to focus on Him as He allows me the privilege of praying for hurting friends. I’ve been participating in an online group of believers who are interceding in prayer, as an infant and his family wait in a hospital for a miracle of God’s healing mercy. Witnessing the bold faith of this forum inspires me to praise God as I press onward. This week, the Lord refreshed my spirit with a call from a friend who shared how He’s using this series to help her through her seemingly endless season of trials. Praying with her lifted my eyes toward God’s undeniable trustworthiness and majesty. How could I have fallen into the ditch of doubt so easily after all the times I’ve seen God come through, sometimes in miraculous ways and other times in ordinary-yet-divinely-extraordinary ways? While thinking about the pain and heartaches that others are experiencing is difficult, praying for them is one of the most empowering and faith-building gifts and privileges we could ever receive. When the weight of emotional or physical suffering feels like oversized boulders on our backs, it may seem impossible to shake off discouragement, doubt, and despair. We may begin to feel as if pressing on is useless, as if fighting is futile, as if persevering is an endless cycle of disappointment. That moment is when we have the opportunity to be the strongest we’ve ever been. As we lean into longsuffering, fully accepting the reality of our utter helplessness, we are ready to trust our mountain-moving deliverer with confidence proven by His past faithfulness. We don’t have to fear falling to our knees and begging God for help. Like the psalmist David, we can embrace our weaknesses like warriors. In Psalm 86, David’s words echo with desperation, as well as determined confidence in God’s character, faithfulness, compassion, power, and love. By admitting his dependence on God, David displayed steadfast courage and faith. His persistence in prayer, as he called to God “all day long” (v. 3), proved his belief in God’s compassion as well as His nearness. David’s tenacious trust of the Lord’s goodness and love (vv. 5-7) confirmed his willingness to rely on the extent of His limitless reach (vv. 8-10). With a spirit of surrender, David devoted his life to following the Lord with an “undivided heart” (v. 11). His commitment never faltered, even when he struggled with obedience. He placed every detail of his existence in his Lord’s capable hands, even when he doubted. No matter what obstacles met David on the road ahead, he remained motivated by gratitude and love toward the One who loved him beyond compare, the One who renewed his thinking and changed his life (vv. 11-13). Though David’s problems didn’t go away (v. 14), he continued to hope in God’s consistent track record and immutability (vv. 15-17). When the walls seem to be closing in on us and we’re trembling with uncertainty, God remains steady and sure. When we feel as if persevering has zapped the last ounce of our strength, God offers to carry us. Our faithful Father created us, cares for us, remains with us, and promises to sustain us. He is the same yesterday and undoubtedly today and forever, so we can count on Him to be true to His Word. When we’re tired of marching down the treacherous roads of the unknown and the uncontrollable, the signs of God’s goodness can be found in our rearview mirrors and in the God-breathed words of Scripture He’s placed within our reach. Lord, thanks for hearing our prayers and reminding us that we can count on You, no matter what we’re facing or how we’re feeling. In Jesus’s name, Amen. Photo taken by and used with permission from writer Jeanne Doyon. Meme created by and quote written by Xochitl E. Dixon. Thank you for your constant encouragement. We all need these words. Keep them coming! I’m so grateful for your friendship, Colleen. I appreciate your continual encouragement and your prayers. Xochi: Your writing is so appropriate to my feelings,and timely. Just this morning i got up feeling emotionally drained but had work piled up to do. My physical strength was minimal, too. After reading a portion from Psalm 40 especially vs. 1 and 2, i began the laborious part of the day. Car repair, wash clothes , think about what we’ll eat tonight, etc. and now the day is mostly spent and the Lord has brought me through it. He has “replied to me for I am needy”. Your writing has been so uplifting for me, and I’m sure for many others too. My strength comes from Him. Your writing is like a dessert. Brother Harold, you are one of the amazing people who I referred to in the first paragraph, one who serves others (specifically your sweet wife) with lovingkindness . . . even through their own suffering. Thanks for your words of encouragement and for being a radiant light for Christ. To God be the glory! I’m praying for you and your wife, Brother. You are an inspiration and you’ll never know this side of Heaven how many people your words have blessed and what they’ve gone on to do as a result. Thanks for your timely words of encouragement, Janet. What a blessing it is to know God chooses to use us in our weakness, even though He doesn’t need us. I love you and am grateful for your faithfulness in prayer, Sister.